This is a continuation of the first post I wrote concerning prayer and something I have not written about, in part because it seems like nothing in comparison to what I grew up with as a child. Nevertheless, I am finding it to be almost as painful. Recently, I decided to do a little “research” and I asked a more liberal Church of Christ - Disciples, friend her take on prayer, specifically in relationship to what I use to pray. Add to that, we are both avid Star Trek fans, so excuse my indulgence and creative use of Star Trek with this one. “Q: Mon Capitan... I thought you'd never get here. Picard: Q... I thought so. What's going on? Yes, I am about to play Q with the use of my own reasoning, but forgive me, dear Christians, if I show little compassion and all the arrogance of Q. For Ex-Christians, you, my friends, are the “unruly crowd”, as we bounce from Trek to reality. Metaphorically, of course, for I have not actually slipped into any depressive psychosis again. I am still very much in touch with reality, I think, but only playing a role that, as a Star Trek fan, am well acquainted with and find quite useful in getting a point across. In the process of explaining my question, I did not give her a reason as to why I asked. I just let her assume whatever she wanted to assume and explained to her, that I knew it had nothing to do with “enough faith” or praying the right prayer and I know you cannot control others through prayer either. I added a little to that “challenge” question by adding the Episcopal view of infant baptism. Many Episcopalians believe that the Holy Spirit enters an infant when you baptized them in order to help you raise that child and a few may add, much to my laughter even as a Christian, that if the baby cries during baptism, it means one or more demons are leaving their body. Sadly, I bought into the part about “helping one raise the child” and to one who came out of the Evangelical concept of God with no help from said deity as a child, what better and more appealing concept? The fact is, and even she admitted to not believing such a thing, it is simply not true. Just as I did not believe that demons left the infant's body when they cried about baptism, I should have thought the same about the Holy Spirit entering the child during baptism. It never worked either, but my priest friend's response to my discouragement at the time was, “Sometimes it takes more than one [healing service]”. I do not remember how many times I requested it for my son, but once she stated she used consecrated water from the river Jordan and oil from Israel. Later, when I confronted her more than once and asked if that was true, she finally admitted to me, without my son present, that she thought saying that would help. Thanks for the bad attempt at psychology, Kathy. All that prayer, all those healing services, all that loss sleep, and wasted time, for what? Now before any Christian pops off with something about being mad at God, let me make one thing clear. I am not mad at any deity, but rather the lame concepts, rites, ideologies, etc that Christians come up with that are pure superstition. There is no anger towards some human concept that many like to call God. I am angry that such superstitious ideas, which simply do not work, are imposed upon people by other humans. I am angry, sadden, and hurt, that such a smart woman as myself, or how I would like to think of myself, bought into the various ideas of prayer, healing services, which of course include prayer, and the superstitious idea that some “Friendly Ghost” would help me raise a difficult child, by myself without any help from others, nonetheless. It has nothing to do with why I became a humanist/non-theist, but it does reinforce the reasons I no longer believe in the god of religion- any religion. Be that as it may and as Q said in Star Trek: The Next Generation, “May whatever god you believe in, have mercy on your soul” (All Good Things...), for I am about to rip into some more very vile and barbaric superstitious concepts, as well as play judge and jury on some more of your concepts and practices concerning various forms of prayer. “Picard: Your own words, your Honor. (to Data) Exactly what followed his Honor's statement that the prisoner would not be harmed? "Can we assume this will be a fair trial?" That it shall be. Back to my Christian friend, who I thought would be more of a challenge to me than some Fundamentalist. The best I can describe her thoughts, as well as Evangelical Fundamentalists', would be in the words of Q himself: "a dangerous, savage, child-race" (From Encounter To Far Point and All Good things...). I had hoped better of this ape-like species, especially with the more liberal Christians, but I found her responses quite insulting and even dangerous in that it corrupts many things, including science, love, and reality. “PICARD: But we demonstrated that mankind has become peaceful and benevolent. You agreed, and let us go on our way. (looking around) Why do I find myself back in this courtroom? My Christian friend in Texas: “Hon, I think you did the very best you could. And I think non-influence of [their father] and genetics had a lot to do with it. None of which is your fault, didn't you once have a therapist that contradicted you in front of [younger son] too. I think you did everything humanly possible. And if you were not a good mother you wouldn't be worried now. Up to this point, she was making rational sense, but here is where her god concepts enters the picture and become appalling to me. IF such a human concept were real and said concept were an all-knowing, all-whatever god that really cared about children, then that deity would know to protect the child from upcoming trouble, especially at the request of a loving and caring mother. Not only that, if it were true that if one asked anything in his name, in this case “The Father, the Son, and the Holy Spirit” and crossing myself as I closed the prayer, a mother's loving and caring request should have been granted. What stronger faith in such a request than that of a mother? Such a deity has never existed and there is no evidence for such a deity. IF such a deity existed then he is neither worthy of worship or even the human race. Her second response was even worse and it concerned my son's addictions dealing with genetics and maybe God gave him those genes for a reason. I even told her that was just as bad as the previous answer and later, when I had thought about it more, it sounded like a Nazi experiment. IF such a deity were to exist, then he has committed more crimes against humanity than Hitler and his men did to the Jews. There we have an overwhelming death toll of at least six million Jews who died at the hands of Nazis, some due to unethical experiments. However, according to the Bible, God has killed more people than Hitler and Stalin ever did and the count, according to superstitious Evangelical Fundamentalists, is still growing. What a barbaric and horrendous god that is, especially one that would purposefully give specific genes to a child, only to dementedly watch what happens to that child. Gee, I thought God was suppose to be perfect. Now why would such a perfect being make something imperfect? For a supposedly perfect being to make something or someone “flawed”, is to take us right back to the horrid Nazi experiment. IF that is such a deity's divine plan, it has little to be desired and why would anyone worship such a demented and heinous being? Also, IF that is true, then why bother praying at all if he gives you the children he wants you to have? If he gives you the children he wants you to have, what does that say about genetics or science in general? What does that say about God, himself? Seems to me, such a statement makes all of that obsolete, including science itself. It also paints a pretty sick god concept too. Let us also not forget the rules concerning “bad children” in the Old Testament, of which my friend believes is obsolete now that Jesus fulfilled it. Are we not suppose to take them out of the city and stone them? That is only for starters concerning the treatment of children who misbehave in the Bible. That said, has not our society advanced beyond such primitive Biblical teachings? No insult intended to my friend at all, but it would seem that she too, as liberal as she may be, is still stuck in a primitive tribal mind set. That said, I got the additional information I needed to expand upon the idea of prayer and all the rites that include prayer fails. Such a shame I do not have the time to ask and wait for Bishop Spong's responses to such questions. I am sure his would be just as entertaining and might be peppered with more rationalism than my dear friend's, which might make it even more challenging for me to think clearly, as we address each other, especially since that was more or less the school of thought I had when I left the Church. Rest assured though, I would be giving even his thoughts Occam's Razor the first chance I got. For me, the cold hard facts of reality and science are more tolerable and satisfying than any god concept one can contrive. Regardless of my friend's thinking and her belief that I have had way too much exposure to Assembly of God people in my area, so much so that, in her opinion, I cannot figure out my own beliefs, her thinking is not much more advanced, in my opinion, though I still love her like a mother. The fact is, her thinking lacks many educated aspects of scientific knowledge and is, albeit reasonable in some respects, not much better than a teenager's thought processes- sprinkled with a little factual knowledge and the rest that she does not quite grasp she fills in the blanks with utter superstitious nonsense. Think I am kidding? Oo! Did I just see the beginnings of Lucy? And I do not mean Lucille Ball, either. Now my knowledge of the “Origins of Species” and Evolution is not the best in the world and hardly at the level of Richard Dawkins, but it is much more advanced than to believe that some demented supernatural being purposefully manipulated our genes and alike to give me the children I had for some inhumane Nazi-like experimental reason. The truth is, my friend was close when she started to discuss genetics, but when she added God to the equation, which was my fault due to inquiring of her views, she totally botched the whole thing. The facts are, I mated with a man who I did not know very well, bringing about my first son, who for the most part, is healthy, aside from carrying the diagnosis of Bi-polar disorder and fairly well-adjusted, but due to my relatives religious beliefs, I caved and married the man. This brought about a second child, in which, out of shear random chance, RNA and DNA mixed together at a cellular level. These cells, without any intervention from any divine being, combined, forming a blastocyst, of my genes, which appear to include not only my biological father's alcoholism genes, but also my ex-husband's genes for addiction too. This is where one's microscope could come in handy, but be that as it may, there was no god who manipulated the process involved. Not only that, there was no god to pray to in which to prevent such a combination of DNA and RNA. There was absolutely nothing anyone could have change, except maybe not mating together. However, we did mate and this was one of the contributers to the end result. After that, I sadly fell for some pretty faulty information concerning parenting, but unlike Q, I cannot go back in time and change that. I: We have the “Ministry of the Word”, which includes penitence. Quaint and simple selection of various verses from the Bible concerning healing, anointing, and alike. Confession is included in this part. Here we have the usual Episcopal “Reconciliation of a Penitent” standard prayer that is to be quoted, which is not much different than the one Catholics say during Mass. Then the priest absolves you of your sin(s) in the name of the Father, and of the Son, and of the Holy Spirit. (Cross yourself here) Now how superstitious is that to think one who is sick has something sinful to confess? Sin causes illness? Now that is a throw back to the Dark Ages, if I ever saw it. All: Save us, and help us, we humbly beseech you, O Lord. Note: There is no god who will save us. We must save ourselves, plain and simple. Priest: “I lay my hands upon you in the Name of the Father, and of the Son, and of the Holy Spirit.” OR “I anoint you with oil in the Name of the Father, and of the Son, and of the Holy Spirit.” (again, make the sign of cross in front of yourself. Careful! Don't touch your stomach in the process. There is a silly superstition about that one too). Then s/he concludes with yet one more prayer, but again, this shows all the signs of Dark Age superstition. Sin does NOT cause illness of any sort. Germs in the form of bacteria and viruses, as well as genetics, cause illnesses. III: Holy Communion This Kathy skipped sometimes, but it includes even more prayers, the last few being prayers for the sick, as well as prayers to be said by the sick- again, all pre-written and extremely superstitious. Fellow ex-Christians, especially my fellow Ex-Episcopalians and Ex-Catholics, since this has become rather long, I will allow you all to, GO FOR IT! Start hammering way at the prayers of this primitive and Dark Age service that many of you may even know from rote, especially the various prayers I did not share from the BCP and are quite similar to the Catholic prayers too. Quite frankly, there is too much goddamn praying in these services and it does nothing but waste a whole evening that could have been spent in quality time at home with the family. Such quality time, in and of itself, could be healing. Probably more so than a goddamn healing service. Unfortunately, as long as humans cling to superstitious beliefs, we will continue to be a child-like society, believing in non-scientific things to explain what we do not understand. For society to advance, we must educate ourselves, even if that means letting go of tribal beliefs and superstitions. In other words, we must give up various god concepts, in favour of real scientific knowledge, in order to advance as a society or we might just meet our doom. Not that my friend or the Episcopal Church's concepts are damning to the human race, but they leave little to be desired and show a very small amount of scientific knowledge, if any at all. A little bit of knowledge can be dangerous, yet knowledge can also be power. In fact, the explanations my friend gave actually made prayer and said rite that much more superfluous and reinforced that it is all rewritten mythology set to a specific culture. Not only that, my friend contradicted her supposed belief that there is not a sky-daddy, but an “ultra-natural being here on earth that is like the wind”, and the BCP also contradicts the many concepts that members of the Episcopal Church hold today too- including and especially Bishop Spong's. IF one's response is to say that “God said no”, then that is like saying “Daddy said no”. Secondly, as most parents would do, they give you what they think you need, not always what you want. What makes her concept different than a sky-daddy concept? In this case, using her religious reasoning, her god concept gave me what he thought I needed and the why of the matter is because “God has his reasons”. She makes her god sound worse than those Nazis who did inhumane experiments on Jews during the Holocaust. Lastly, why do we have to beg? Why repeatedly do a specific rituals over and over again to gain healing? What is the purpose? That puts us right back to being a very primitive species in our thinking. So, primitive that education flies right out the window and such thinking could potentially be dangerous. This also brings us right back to the question of “What purpose does prayer serve, especially if such a deity has his own plans?” Absolutely NOTHING. So, in essences, whether or not she believes my prayer was a waste of time and energy, it only leads to “Nothing fails like prayer”. The same goes for repeatedly doing healing services over and over again. It is all a waste of time and energy. Once again we are right back to people needing to take responsibility for their own lives, without relying on the supernatural. Such things just do not work and are doomed to fail and, given the scientific knowledge we have, keeps us in a state of ignorant and child-like thinking. No wonder Kathy was so angry when I told her that I am a humanist. She has no control over me or even the input she gives me over such issues anymore. She can no longer keep me in such child-like thinking, so there ends our supposed friendship. It seems to me that people need to grow up and stop wasting time on useless and superstitious things, like prayer. No matter the answer any Christian gives, concerning prayers and alike, they end up contradicting themselves in many ways, as well as show their ignorance. They also end up painting very demented and inhumane concepts of a deity, that in no way resemble reality. At worse, they, like Pat Robertson, sound like primitive minded people, who have no education at all. At best, they, such as moderates and liberals, sound like partially educated teenagers, who fill in the gaps of knowledge with their own fantasies. In either case, we, as a society, need to grow up and face reality, because such responses just do not do modern day knowledge any justice and paints a horrid picture of their god concept. Even my friend painted me a horrid picture of her god concept and I found it quite insulting, because my younger son is not a product of some demented and inhumane Nazi-like experiment. That and she might as well have said, “But what about the divine plan? You can ask, but God has his mind already made up and you can't change that with prayer. So, yes, you did waste your time, due to his divine plan.” I have yet to find any Christian to give any reasonable and justifiable answers for prayer working or not working and not contradictory to what they say is their god concept. They also explain very little as to how it is a productive use of our time and energy. Not even a more liberal Christian could explain it and all she did was reinforce the fact that, “Nothing fails like prayer”, especially when I thought about what she said in more detail. 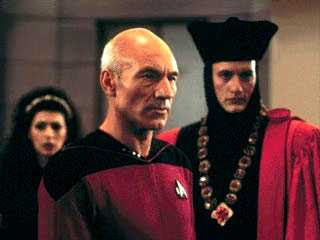 “PICARD (tight): Having rendered a verdict... have you decided upon a sentence? Q: Indeed. It's time to put an end to your trek through the stars... to make room for other, more worthy species. PICARD: We're to be denied travel through space? Q... even you could not be capable of such an act. Thus, my final judgment: Any and all pleas to any and all human concepts of a deity should cease and desist immediately, so that we can hopefully have more reasonable and productive lives. In so doing, we will stand on our own two feet, facing the challenges and realities of life head on, without the use of superstition or religion, as we do the best we can with the knowledge we have at the time and updating it as we acquire new information. To do otherwise is to remain in a child-like state with primitive and uneducated thinking, which could have the potential of destroying our own species long before our large star goes nova or even supernova. “DATA: Would you care to deal? PICARD, happily dealing the cards: So. Five card stud, nothing wild. The sky's the limit.” ~ "All Good Things..."
If only real life ended with such happy endings and in which all people made such declarations as my judgment on humanity.